The other customized wrist straps mainly include custom paper wrist band, it can be used in many occasions, such as ad interim meetings, panel match or other group events. 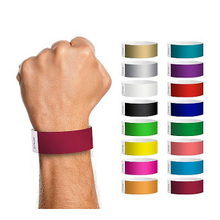 These custom paper wrist bands are safe and they can be easily identified by distinct groupings. In order to make the application of paper wrist band more convenient, we offer you with custom service, you can tell us your demands. The custom paper wrist band can also be used as cheap ticket substitutes offer you more security and efficiency, add personalized feeling. The custom paper wrist band has various colors, suitable for any design preferences. If you can’t find the color you want, you can contact to tell us. The custom paper wrist band is tear resistant, stretch proof and waterproof, so you can rest assured to use it. For more order information, you can contact us.